Welcome to video nine in the Beginner Guitar Quick-Start Series. In this lesson, we’re going to go over the last two guitar chords you need to know to play the full song at the end of this lesson series. The two chords are G major and D major, which are open chord shapes that you will use often in your guitar career. Remember everything we learned in the last lesson about fretting hand technique like relaxing, pretending to hold an apple, keeping your thumb on the back of the guitar neck, coming down on the tips of your fingers, and placing your fingers right behind the frets. Let’s start with the open D major chord shape. The first thing to notice on the chord diagram is the ‘X’ above the E and the A strings, which means you’ll leave these strings out of the chord altogether. Place your first finger on the second fret of the G string, second finger on the second fret of the high E string, and third finger on the third fret of the B string. For all three notes, make sure you’re right behind the frets and on the tips of your fingers. This chord is a bit harder because you have to place your fingers in a small area, and you have to make sure your fingers aren’t accidentally brushing up against any other strings. Using your pick, strum through just the top four strings. If your chord sounds muted at all, make sure your fingers are coming down right on the tips. Chord Tip: Go through your process of committing this chord to memory. Make the chord shape for thirty seconds, take it off, shake out your hand, and repeat. If it takes you a few seconds to make the shape, that’s okay. Take a look at the chord shape when you make it to remember what it looks like, and remember what it feels like as well. Bonus Tip: Have your guitar set up by a professional. It usually only costs $20-30, and it’s worthwhile. Your guitar will be easier to play and your practice time will be much more enjoyable. Now let’s go through the open G major chord, and this is probably the hardest chord of the Beginner Guitar Quick-Start Series. I’ll show you two different ways you can play this chord, using either your first, second, and third fingers, or using your second, third, and fourth fingers. I recommend using your second, third, and fourth fingers, but let’s take a look at the chord shape first. Many new guitar players learn this shape with their first, second, and third fingers. Place your second finger on the third fret of the low E string, first finger on the second fret of the A string, and third finger on the third fret of the high E string. 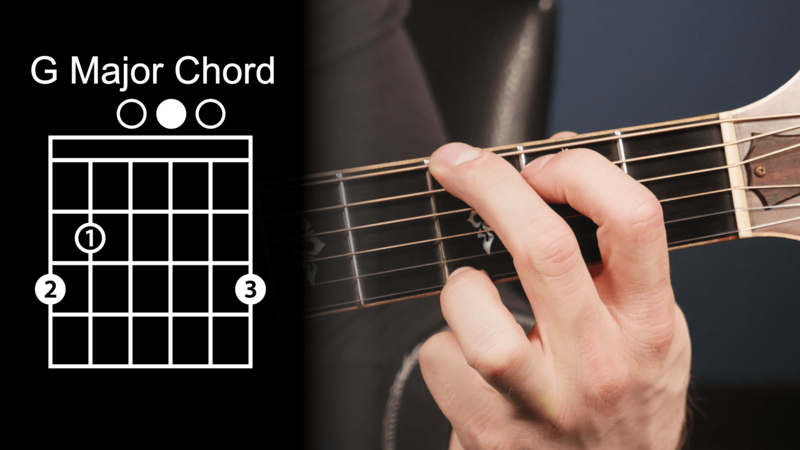 For this chord, you can strum all six strings. I recommend using your second, third, and fourth fingers though. Place your third finger on the on the third fret of the low E string, second finger on the second fret of the A string, and your fourth finger on the third fret of the high E string. It’s the same chord shape, but we’re using different fingers to make the chord. 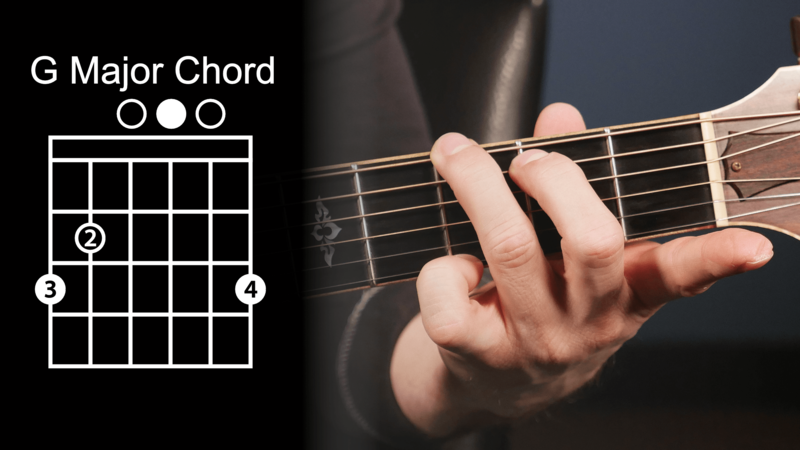 The reason I recommend using your second, third, and fourth fingers to make this chord shape is because changing from a G chord to a C chord is very common. If I’m using my first, second, and third fingers to make the G shape, changing to the C is a big movement. If I make the G shape with my second, third, and fourth fingers though, the change is easier because it isn’t as big. Use the same memorizing process for the G chord, putting the chord shape on the fretboard multiple times. Think about what it looks like and how it feels until you have it down. Many new guitar players struggle with changing chords smoothly, and the reason this happens is because they don’t learn each of their chord shapes thoroughly before they start trying to change chords. 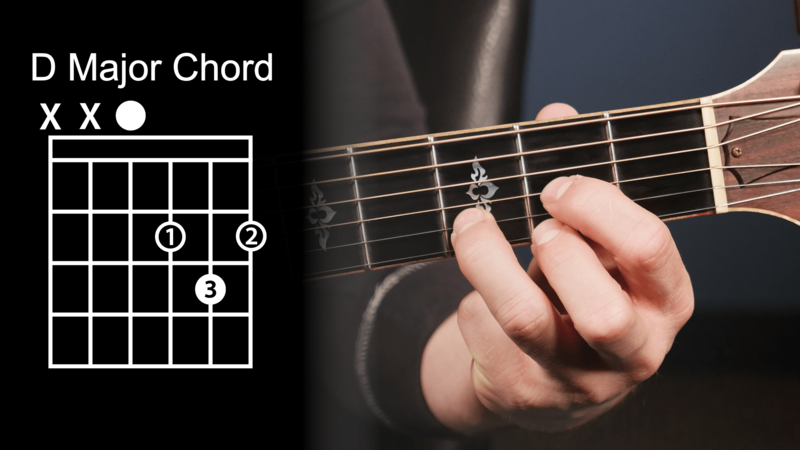 Learn each of these chords so that you can go right to them before trying to switch. When you don’t know a chord fully yet and try to change chords, you’re compounding the difficulty of knowing the chord and switching it which makes it really frustrating for you. Once you have two chord shapes down, like the G and C, you want to visualize the chord you’re going to switch to before you need to. This will give you a better chance of making the chord correctly. As I make the G chord, I start to visualize the C chord shape before I need to move to it. In order to prepare for the next lesson, choose two chords at a time to practice switching chords. For example, practice switching between A minor 7 and C. Once you have those two chords down, try changing from A minor 7 to D. Remember to visualize your next chord before you need to change to it. Try to work on your chord transitions several times a day to train your muscles and give you a better chance to remember what you’re working on. In the next lesson, you’ll learn how to play your first song on guitar. In the next lesson, you'll learn how to play your first song on guitar. If you have any questions on the G major or D major chords, you can contact us for help.